5 Ways That You Can Organize and De-Clutter This Month! When Netflix launched, “Tidying Up with Marie Kondo” they never anticipated how successful it would be. The premise of the show is Marie Kondo, a professional organizer, helps families who are struggling get their homes de-cluttered and organized while a camera crew films the entire process. You can see photos of people all across social media “MarieKondo-ing” their homes since the show first aired January 1st. 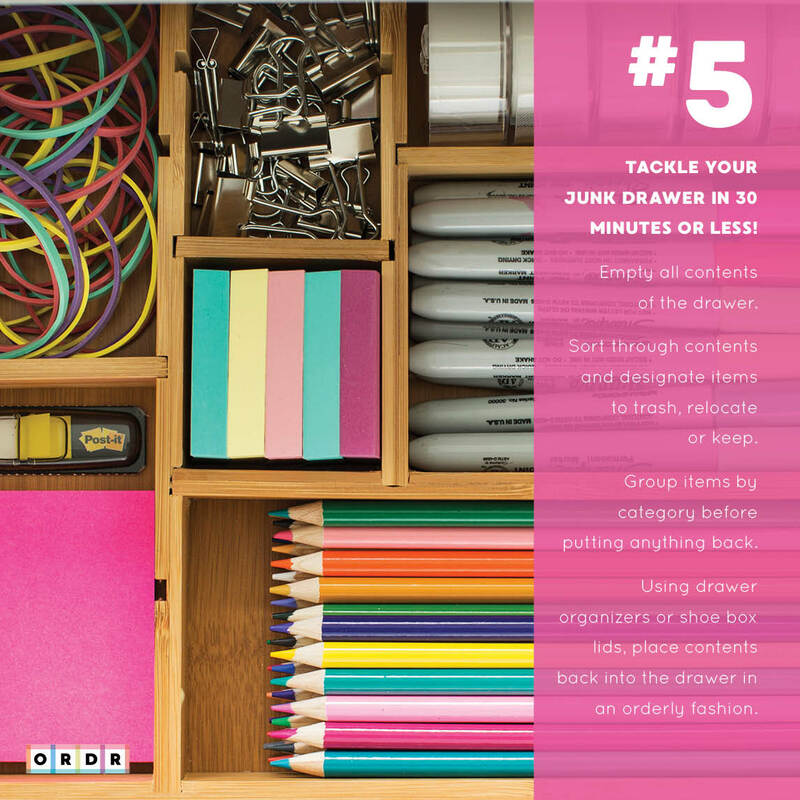 In the spirit of tidying up, we asked Dana Silberman, founder of Atlanta based professional organizing company, ORDR, to share with us her 5 ways that you can organize and de-clutter to bring joy into your home. 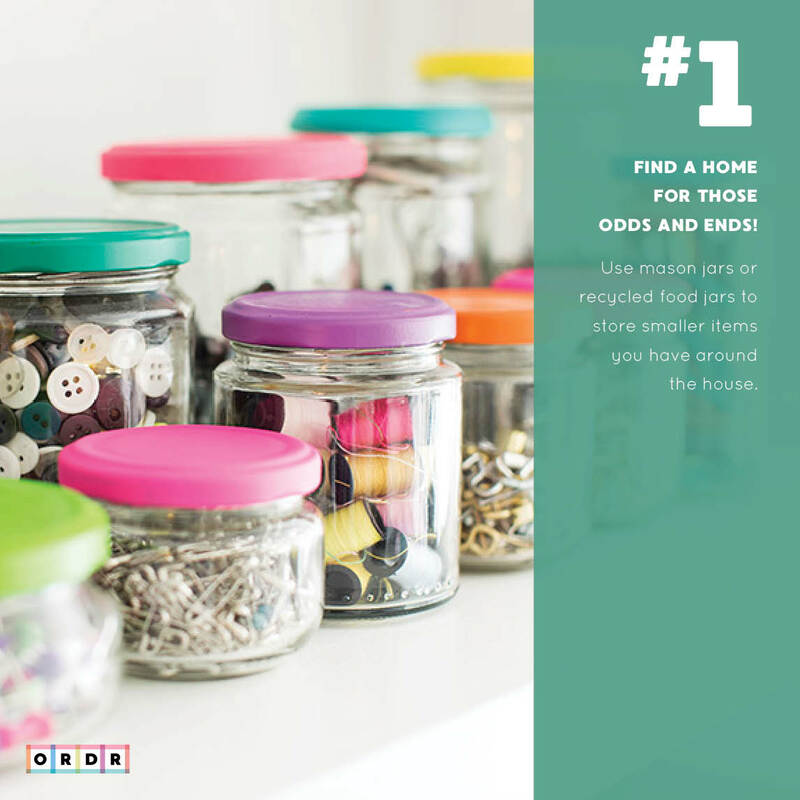 Find a home for those odds and ends. Little items get stuffed in a junk drawer when you are not sure where to store them. Use mason jars or recycled jars that you have around the house. Store like items together. Example: Organize your sewing supplies. Buttons, safety pins, and thread are stored in their own container. Paint the jar lid to create a beautiful array of color to your collection. 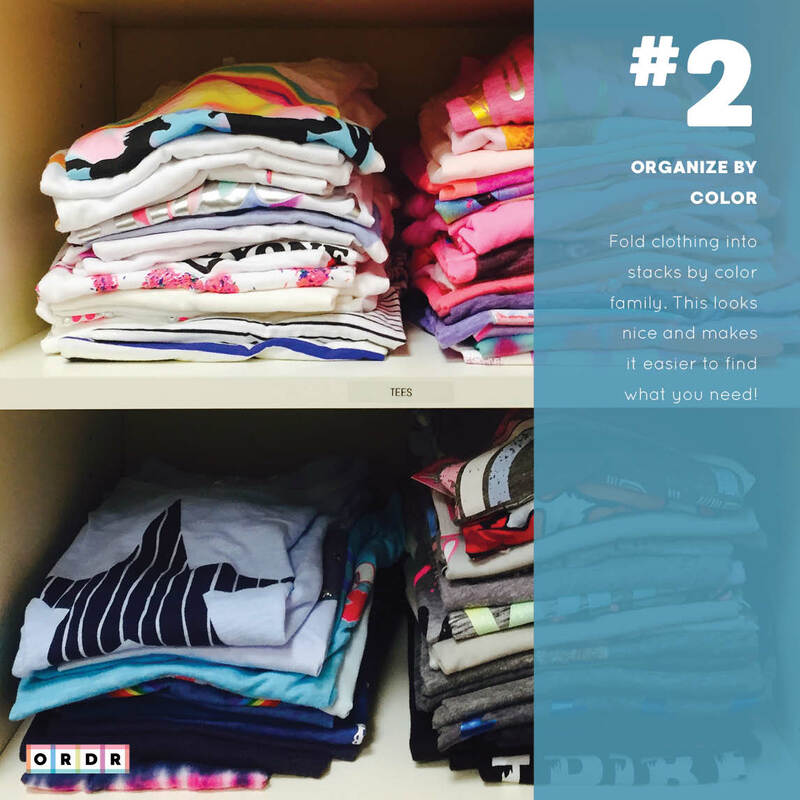 Fold clothing into stacks by color; This will make it easier to find what you need to complete an outfit. It looks pretty too. What if my top has multiple colors? Use the base color to organize. If your top is white with a pink design, then it should be stored with the white tops. If your top is pink with a white design, store it with the pink tops. 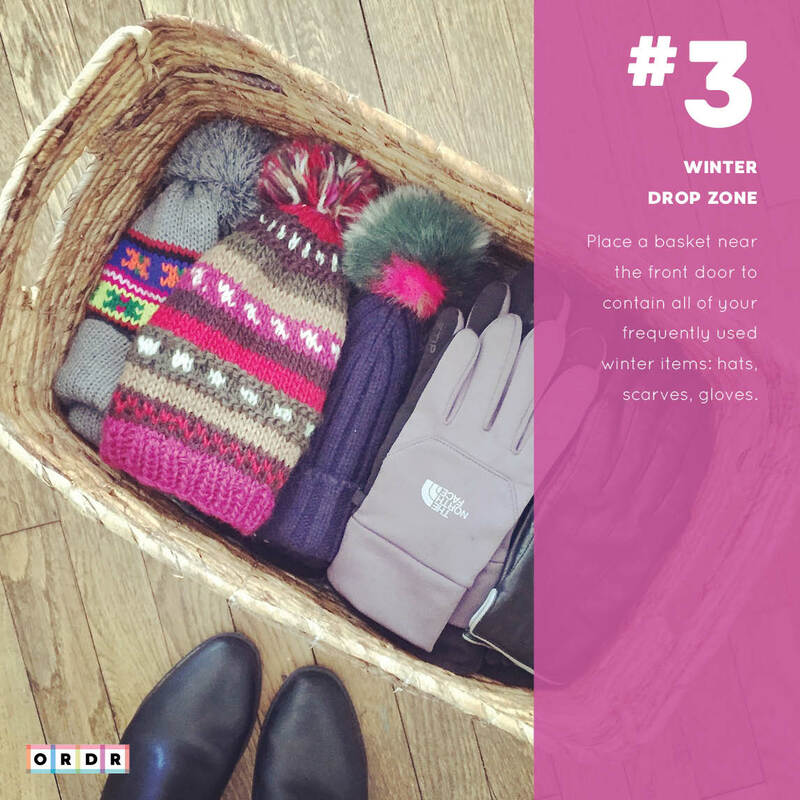 Create a winter drop zone by the front or back door as a place to keep gloves, scarves, and hats; This keeps you from losing one around the house. When you are in a hurry, you will know exactly where your things are. You can even expand this concept during other times of the year by creating drop zones for your gardening supplies in the Spring or items like hats, sunglasses, and sunblock for the hot Summer months. Have you ever been looking for a certain top only to find it wrinkled on the floor in your closet (along with other tops you thought you lost)? The easiest way to avoid this is to replace your plastic hangers with slim, non-slip hangers. This hangers work amazingly well and also help keep crease lines from showing on your clothes. 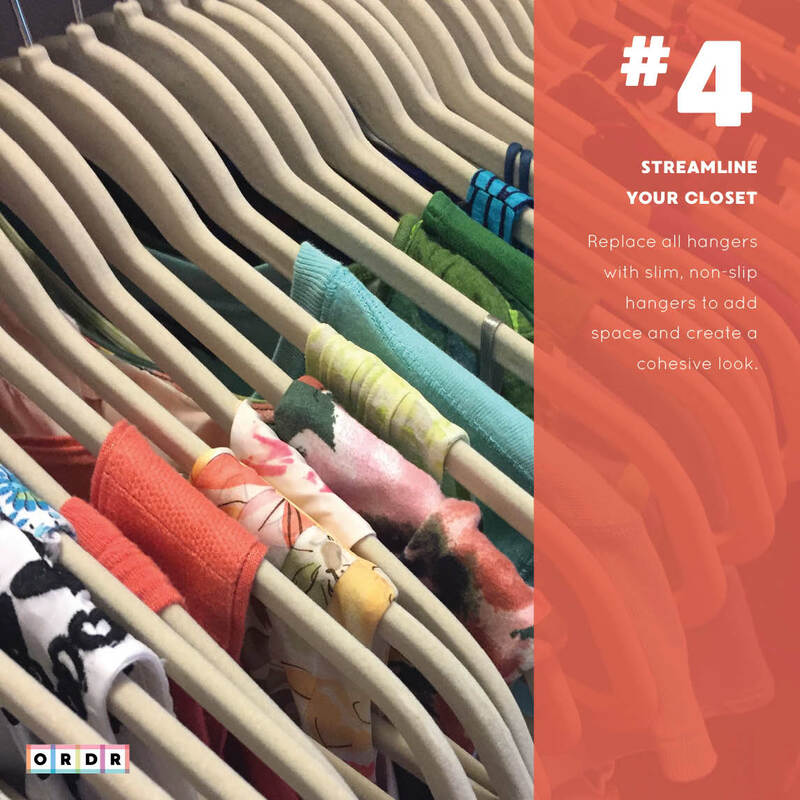 Your closet will look more cohesive and pleasing to the eye. Helping to spark joy for you when deciding what to wear. Tackle your junk drawer in 30 minutes or less! Start by emptying all the items in your junk drawer. Sort like items and start to designate them to one of three piles: Trash, Keep or Relocate. Before putting them back in the drawer, decide how many of the same item is reasonable to keep. Do you need five chip clips? Or three ice cream scoops? Keep only the amount that you need or will use up quickly and donate the rest. Use shoe box lids or small containers to organize your items when putting them back into the drawer. Are you overwhelmed on where to start? ORDR can provide you with a consultation to help you decide what needs to be tackled first. Check out recent projects on their website to see how they can help you get organized.